It is JUST that He sends, It’s for MERCY we go. JUST MERCY bought a large garden plot and began planting to help provide food for the mission and people of the surrounding area. Besides vegetables we have planted 40 lime trees, 10 grapefruit trees, 20 sweet orange trees, 10 “cherry” trees (different than ours), AND 288 banana trees!! The food is so desperately needed! A solar dehydrator was built in the shop for a young man who is trying to start a business drying mangoes. The first prototype of a fish habitat was built with the goal of trying to increase the fish population in the bay that has been so depleted. Another trip to Janou was made and we saw more roofs being installed! Bill made another visit to the school at Chapelle. The weekly food distributions to the old folks continue. So do the confrontations with darkness! 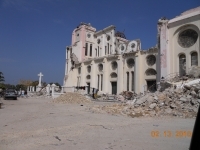 There is an obvious battle going on between the light and the dark in Haiti. The confrontations grow as JUST MERCY seeks to bring light to the dark. Little things like first aid for a cut, a few groceries distributed each week to old folks who have little help, and even just plastering over a crumbling wall to keep debris off an old woman's bed, all in the name of Jesus, bring help to the poor. At the school in Chapelle, the children had a tree planting day!! 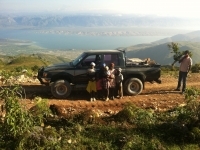 In June, another team came from MO to check on the progress at Janou. Another grueling hike up (one member of the team had to stop half way up the mountain and spend the night with a family there!) and it was a blessing to find gardens growing and producing from the seeds the team brought up in March and new roofs being applied to leaking houses. What a blessing! 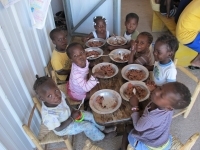 January found Skip Lindsey once again bringing a team to Haiti to help JUST MERCY on Ile a Vache. Dr. Konsavage also came with them again so along with building the new wood shop, many people with medical problems were treated. We also had a small Operation Christmas Child box distribution for the children of a village on the island that was devastated by the Hurricane. 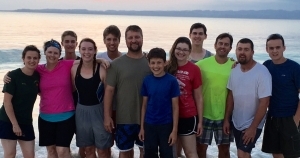 In Feb., a team from Monett Community Church in Monett, Mo, came to Ile a Vache. Shaun and Pam worked to stitch up a bad cut on a boys' leg. There was also a badly burned little boy whose face we treated. We traveled to the mountain village of Janou that had been nearly wiped out by Hurricane Matthew. The team returned to the states to speak to the church and they have "adopted" the village of Janou and are raising funds to replace roofs and repair houses there! Praise the Lord! On October 3, 2016, Hurricane Matthew roared across Haiti, bringing destruction in its wake! It took 5 days for Bill to get back into the country. 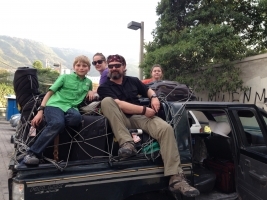 He stopped in Port au Prince to get a truck load of food and headed to the island. Several friends from the US flew in to help JUST MERCY along with one from South Africa and one from Thailand! We brought chain saws to help with the clean-up. 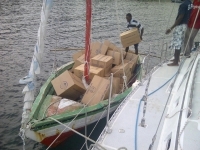 JUST MERCY continued to bring emergency shipments of food into the island for the next several weeks until a "stoning" riot stopped the mass distributions. We then continued with smaller shipments. The team also offered medical care to those who needed it. 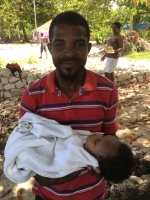 Along with continued first aid for minor complaints of many people, the summer of 2016 saw two lives saved with the ambulance boat1 One was Christela, a 19 year old who was taken to the mainland and ended up in the hospital for several weeks. The other was a two month old baby of one of the men helping us in the wood shop. A chicken house was built for a family on the island and work in the wood shop continued. Back in Fonds Parisian, our Haitian daughter Nono had her baby. Many had been praying for her as there was some concern about the health of the baby but he was fine! Our daughter Hannah arrived in Haiti with two of our grandsons, Anodos and Paul! Richard, our boat captain also came. Everyone, including the boys, helped JUST MERCY cut the lumber and get the roof put onto Estane’s new house!! Work in the wood shop continued with some beautiful Adirondack chairs being made and spoons out of exotic hardwoods that can be taken back to the states to be given to friends for donations to help these men support themselves and to help JUST MERCY continue working in Haiti. Cristophe is a new worker in the wood shop. 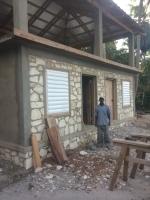 He is working on building a concrete house around the hut his family currently lives in and working in the woodshop is helping him to accomplish that goal. Farah occasionally has seizures and fell into a fire, burning herself badly! She comes on a daily basis to say hello and have her burns treated. Our Haitian daughter Nono became pregnant right when the Zika virus arrived in Haiti and she came down with it. We are praying for a healthy baby in a few months. 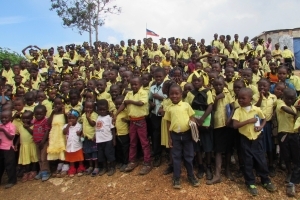 JUST MERCY continues to support the Chapelle school in the mountains, giving 300 children an education and a meal each day. In January 2016, Skip Lindsey brought another group back to Haiti! Dr. Chris was with them and though clinics were not planned, there were still a lot of people that came for medical help. 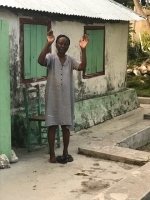 A highlight of the week was a gift distribution done in the coastal fishing village of Baie du Mesle (Bed-z-mel) and showing the Jesus Film after the gift distribution. 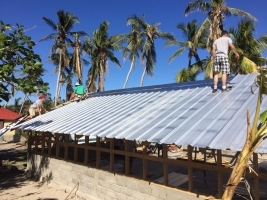 The KY group helped get a roof on one of the Haitian fisherman’s house that had gaping holes in it, wetting everything inside with every rain. The team built the second story deck on the woodshop!! A trip was also made to a small fishing island bringing containers of fresh water, a rare thing on that island. It was a busy few months. A family in Fonds Parisian was suffering from a terrible infestation of bed bugs. Bill acquired the things needed and they emptied the house, sprayed to kill the bugs, and had the block walls smoothed up to get rid of the hiding places for the bugs. 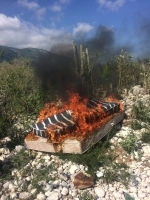 The old mattresses were burned and replaced. A team came to Haiti for 10 days to help. 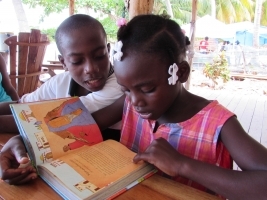 They helped in the wood shop, interacted with the people of the village, and learned to sail with Haitian sailors. 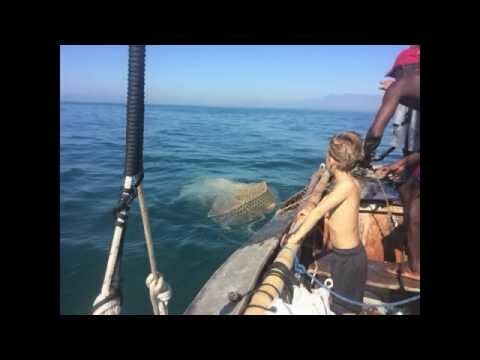 They visited the sailors in their homes and at the end of the week, they held a race with each boat having Haitian and American crew members!! They sailed to a small island and shared with the people there, popped popcorn for them, and showed the Jesus Film The men in the wood shop are really improving at making the spoons. 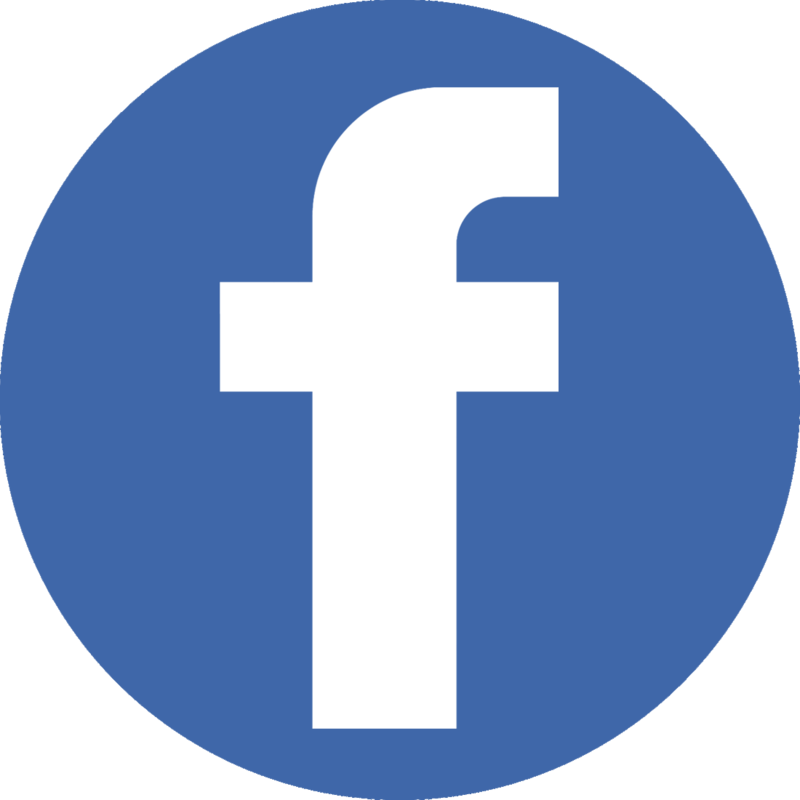 We are giving to people for a donation of $30. Check out the website where you can order. A chicken house was built at Mssr. Yvon's house up the hill from Kapok. 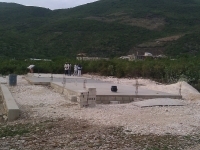 We plan to build another one to help provide food for people. In August, progress was being made on the wood shop and the men were beginning to make beautiful wooden spoons!! The sick and helpless continued to come as they do on nearly a daily basis seeking help which we give as best we can. Bill and Sonel made a hike into the mountains to Janou, a village no outsider had ever been to before, meeting people with next to nothing. It was wonderful having Bible story times on the deck with the children. They loved to read out of The Jesus Story Book Bible that we kept on the table so they could do so. Work on the boat continued. Chad Nissley came for three weeks to help. What a blessing. Finally, the boat was completed and launched!! In early March, four members of the Aaron Hymer family came to serve. They had a great 10 days being involved with JUST MERCY. With new tools brought in, construction of the boat began. 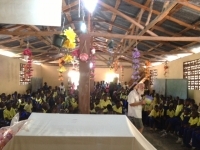 We visited a school and gave Bibles to children who had completed The Greatest Journey course. Yvon and his family hosted us for dinner at their home up the hill. The Hymer's helped give first aid to those who came for help and they loved interacting with the neighbors and all the children who come regularly to visit, sharing their faith. Mackenzie and Mason passed out Bundles of Hope backpacks that they brought for children. The Hymer's also brought a wedding dress and ring for our friends Soner and Lana so that they could get married after being together for years! We so enjoyed the Hymer's visit and are so grateful for all they do to help JUST MERCY! When Bill came home for Christmas, one neighbor girl asked him if he would bring her a dress so she could go to church. The Aaron Hymer family took that request and made up "Christmas" packages of clothes for over 30 children for us to take to Haiti in January. 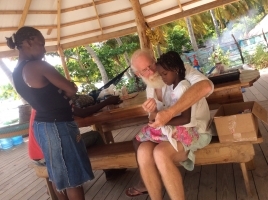 The second week of January, Skip Lindsey brought several friends to Haiti for 10 days. Along with other donated clothes the team brought, we were able to give over 60 children new dress clothes. The next day, 20 of them showed up to go to church with us!! We also made a "Christmas Dinner" for the church and neighbors, had a "baking school" for some friends, passed out Operation Christmas Child boxes to an island school, helped harvest logs and run the sawmill, played with the children, built things for the base, and hiked to the market village on the island, stopping to help dig a ditch with some Haitian men. It was a wonderful month with many of the team wanting to return next year. The sawmill continued to produce lumber in the fall of 2014. We were able to bring some additional needed woodworking tools into Haiti in our suitcases including a Delta chop saw and a bandsaw. The Haitians were amazed at the tools! People continue to come for medical care on a daily basis and we are blessed to be able to provide first aid and some pain medications. The neighborhood children are often found on our deck and we love interacting with them. In June, the Chikungunya virus was sweeping the country of Haiti. The only treatment is to help alleviate the symptoms. Acetaminophen had disappeared or was being sold at exorbitant prices. JUST MERCY sent out the word in Joplin, MO, and within a week, a large suitcase full of acetaminophen and other medicines were collected in Joplin, MO, and taken into Haiti the next week by Jesse Montgomery and Cody Moore. Some were sent to the mountains with Dr. Jolius and the rest went to Ile a Vache to help the people there. The sawmill was producing boards for many projects and badly needed chairs are being built! Besides the needed medicines for Chikungunya, people come daily for first aid with injuries of various sorts. 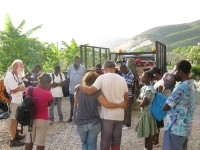 We continue to serve and seek to share God's love with the people of Haiti. 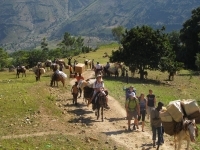 Friends came from the US to help and together we made the hike to the remote village of Lalou in the mountains. Long time JUST MERCY friends, Len Clevenger and Sid Davis came to visit on Ile a Vache and we sailed to the small island to look at their broken water catchment system and see what could be done to fix it. The sawmill arrived on a freighter, was unloaded, and put to good use. 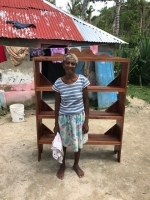 Janet came to join Bill for the month of February to take part in working on the base, visiting with the neighbors, administering first aid on a daily basis, feeding people, having Bible story times on the deck with the children, and having many interactions with people. 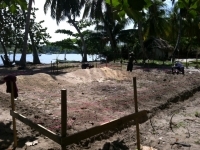 This two month stretch was marked by continued work on the base at Ile a Vache and also several Operation Christmas Child distributions both in the mountains and on the islands. These two months were spent constructing the two new smaller bases, one in Fonds-Parisien and one on Ile a Vache. Good friends and family came to help accomplish the massive job. 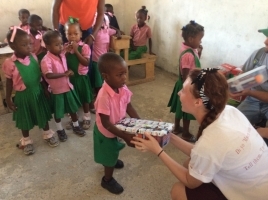 March was a very busy month for us in Haiti with two trips to the mountain schools and a Operation Christmas Child gift distribution in Lastic! We returned to Haiti and were joined by a team from Kansas. 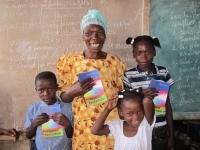 We went to visit the schools and have a "graduation" ceremony for children in Pelerin who had completed The Greatest Journey course and would receive their own NEW TESTAMENT! Our Haitian "daughter" Nono got married in December. On the 17th, JUST MERCY held another gift distribution in the mountains with boxes from Samaritan's Purse Operation Christmas Child! What a blessing! Sept. 2012 - School Books and THE JESUS FILM! Thanks to several friends, we were able to buy the books for the 500 children at our three mountain schools. They had to be transported up the mountain in bundles on the children's heads. While up there, we finally showed the Jesus Film for Children at two of our schools and rejoiced when Poppy, our elderly host, committed his life to Jesus the next morning!!! Our visiting team made some major improvements to the base. 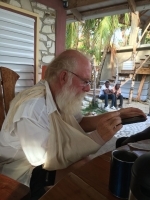 Our friend Jim H. came to Haiti for a month to help Bill start work on the new mission base, needed as we can no longer lease the big house we have held for two years. Mission of Hope began to give us food for our mountains school lunch programs which will let us keep the children fed on school days!! Yvrose's compound and family are still growing. Dr. James Hamilton from Joplin came to the mountains to hold another medical clinic. Jon, James, Anthony, and Hannah P. flew in for a week to 10 days and helped make 30 benches for the schools. Molly and Nelly came for two months to help Yvrose with her children along with Hannah H. Brett M. helped with many things, including fixing the water catchment system on the school at Pelerin. We had our first ever teachers meeting and introduced the first two Christian character classes!! Katheryn M. came in March to help Yvrose after Molly & Nellie left. We are so grateful for friends who come to work and share in our lives in Haiti. After another medical trip with Dr. Suarez in early Dec., Bill returned once again to the mountain to take 500 Christmas boxes from Samaritan's Purse to the children who attend our three schools and share the Christmas story with the children. It was the highlight of our year!! Fall of 2011 brought several trips to the mountains. We took a team with our first doctor, Dr. Chris Konsavage, into the mountains to hold a clinic for the people. 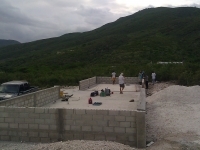 The team also started on a bathroom for Yvrose's home. Yvrose took in two twin babies. Friends from CA came to help and we took donated cots up to the cholera clinics to get the patients off the floor. 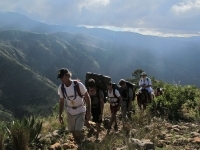 We met Dr. Alfredo Suarez and took another medical trip into the mountains to hold a clinic for the people. God was doing amazing things. We raised the money to put a well in at Yvrose's place!! We raised the money to buy some mules so we would have a reliable supply line for the cholera cilnics. 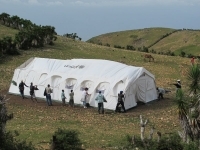 We took another tent up to a second location and opened a second clinic. Victory compassion put up a 3rd building for Yvrose. In April, Yvrose came to the states with us and shared her story at a few places. 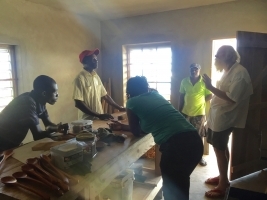 Our friend, Jim H., came over to Haiti and began work on a kitchen for Yvrose's family. Upon our return to Haiti, the cholera was worse and we began to do what was necessary to open a cholera clinic in the mountains where there was no help, taking up a donated tent, finding donated medical supplies, and hiring nurses to stay in the mountains to treat the people. Our first team of helpers from the states arrived to help on Yvrose's kitchen and go to the mountains with us. Early 2011 found us working in cooperation with Victory Compassion of Tulsa to put up two small metal buildings for Yvrose and her family!! Our first volunteer from the states, Chevo V., worked to completely revamp the mud and twig home of a poor widow in the village next door. We also met Manolo and Juani Cazorla, a couple from the Canary Islands, Spain, working in Haiti. They came to live at the JUST MERCY base, worked hard, prayed hard, and began to bless our lives!!! In the fall of 2010, we met Yvrose. 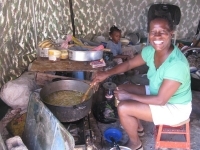 She and her husband Pierre Richard had taken in 16 children since the earthquake, living in two bare rented rooms, struggling to find food. 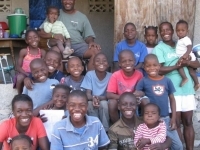 Yvrose, a Haitian American citizen, was passionate about God and loving children in His name in Haiti. Around this same time, cholera broke out in Haiti. 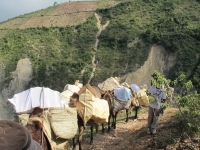 The mountain people had no medical recourse so we started seeking ways to help. We also took on the support of a Christian mountain school in Pelerin with 180 students in an area where adult illiteracy rates push 100%. It was going to close due to lack of funding. 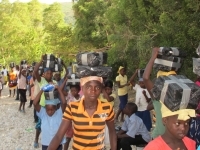 Upon hearing of the deadly earthquake in Haiti in January, 2010, Bill and Janet Montgomery personally bought nearly 200 tents along with other camping equipment and sent them to Haiti. Bill, son Jesse, and nurse Terry G. flew over and worked for five weeks, bringing medical help, shelter, and comfort to people hurt and displaced by the earthquake, seeking to share God's love with them. Janet, so GOOD to see the short video of how Just Mercy is sharing the good news of Christ in Haiti. We love you guys and are so grateful for your hearts! Thank you, Peggy. The Lord has done amazing things the last few years! God has certainly used you and Bill to share His love and His word with the people in Haiti. The sacrifices you have made and continue to make are an inspiration to us all. I am praying for your physical strength and for wisdom and discernment as you make decisions for your work and for yourselves. Hi, Becky. I was reviewing our photo page and saw your comment. Please forgive me not answering in a timely manner. Thank you so much for your encouragement and prayers. It means so much to know people are praying for us!! 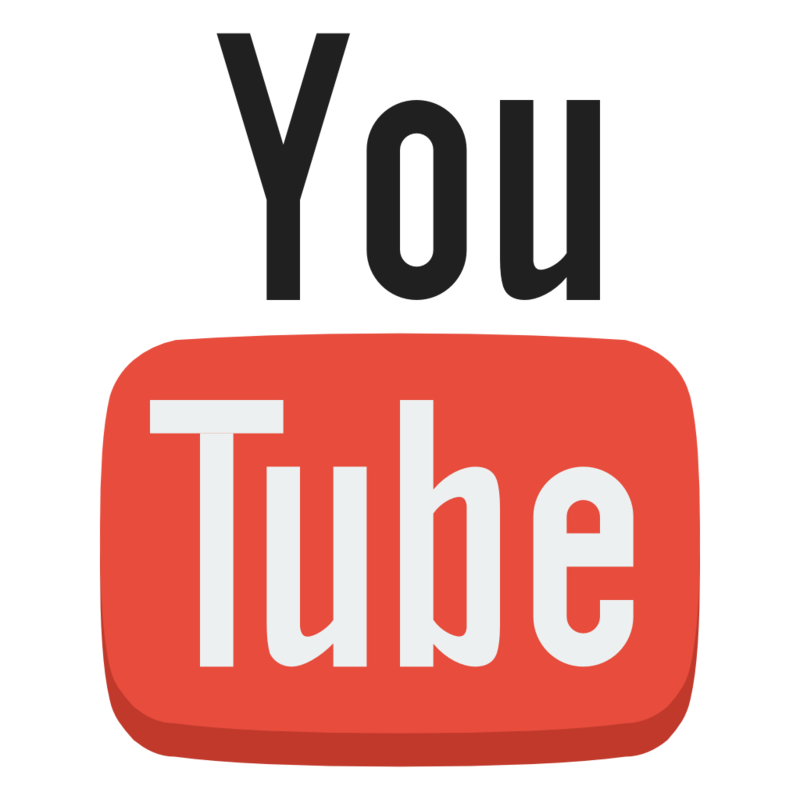 To subscribe simply add the information below. A confirmation email will be sent to you!